I remember kids throwing wood chips at my head and my friend running away from them with me. I remember being picked last for gym class nearly everyday, and I especially remember the one girl who picked me first. When you're bullied or left out and one person sticks up for you, it can make a world of a difference. The new Android commercial, which debuted during the Academy Awards last weekend, shows the power of sticking up for someone who is being picked on, no matter how different the person may be from you. The commercial has been described as the "real winner of the Oscars." 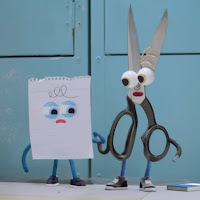 As a kid, you probably played "Rock, Paper, Scissors" to settle arguments (or maybe you still do). 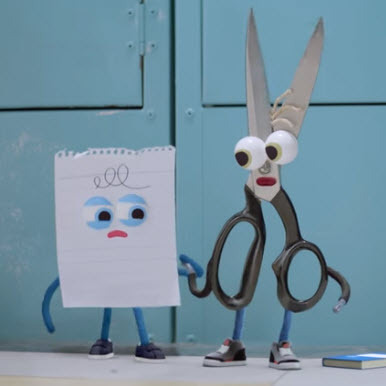 The 70-second commercial, released by Google, shows a piece of paper being bullied and then a pair of scissors scaring off the bullies. Then the paper does the same for a rock, and the three walk off together into the sunset. In the childhood game, scissors beats paper and paper beats rock. The commercial uses it as an analogy that, instead of fighting against each other, they use their strengths to help one another. Yeah, it's just a commercial for a cell phone. But I think this commercial could be used to teach children not to bully others and, instead, be there for another and stick up for them. For more information on how to stop bullying at school, online and in the community, visit www.stopbullying.gov. Thank you for sharing this info, Great blog. I regularly consider myself a decent author until I'm composing something and wind up investing so much energy idealizing one sentence. So I thought that it was extremely interesting,it makes you a decent author. I likely have a tendency to solicit myself a considerable measure from inquiries as I'm written work. I don't consider myself to be a great author in light of the fact that there's dependably opportunity to get better however no less than a successful essayist. I am writing best resume writing service, happy get this opportunity thanks for sharing. Everyone has childhood memories and some of them memories, few are the never forgettable. It is nice to read your childhood memories in deep which makes me nostalgic. It gives a different feeling and happiness when someone talk about sweet memories. A very funny video. I will sure show this video during my consultation class to students who are taking education consultation as well as academic writing help at www.secureassignmenthelp.com. They will sure like this. I am also thinking of playing game on students different childhood memories which will give them unbelievable experience. I agree with you, few memories are never forgettable. Memory in childhood is qualitatively and quantitatively different from the memories formed and retrieved in late youth and the adult years. I will sure share this video with my UK students. I would be happy to share this with my college students who come to seek professional help with personal statement from me. It’s really very funny video. I like it. Childhood memories are some of the most precious gifts to hold dear to your heart especially as you grow up. We all love going through old childhood photos and making fun of what everybody used to look like. Several suggestions have been proposed to explain the mechanisms behind childhood memory. Until relatively recently, it was thought that children have only a very general memory and that “overwrite mechanisms” prevented the later retrieval of early memories. A very nice video, I will share this with my academic students, who are looking for university assignment help service at elite assignment in UK. And I also share my childhood stories with them. Childhood memories are some of the most precious keepsakes to hold dear to our heart—especially as we grow up. A very nice video you shared here. I would like to share this video with my students, who are come to seek me cover letter writing service at CV Folks. Whether Childhood memories remembering something that made smile or brought out the happiest part of you, certain childhood memories just stick with you for a lifetime. Happy to read your blog. What an inspiration video on be together rather you are form the opposite side. Kids would love it and understand the importance of being together. And yes thanks for reminding the childhood games scissors beats paper and paper beats rock. As we grown up and settled down in life. By the profession I am academic writer at http://www.qualitydissertation.co.uk and also running playschool with the my wife, your video and post inspired me to do different to keep engaged kids and teach them not to bully others and, instead, be there for another and stick up for them.